Rescue workers on the scene at Cave Point Park. Door County Sheriff’s Office photo. 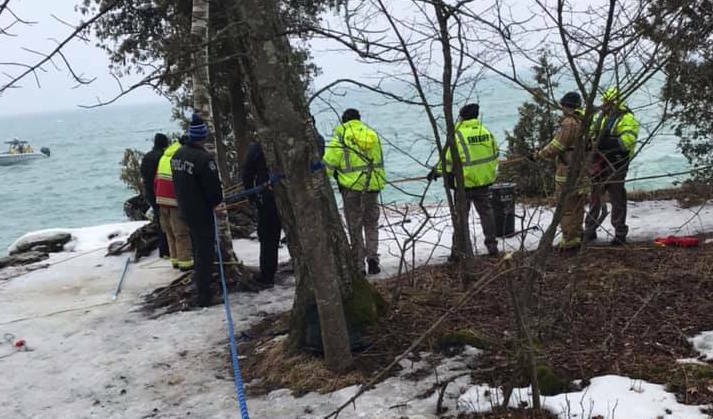 NEENAH — A memorial service is planned for April 6, 2019 for Eric Richter, 57, who died in a February accident at Door County’s Cave Point Park. His body was recovered March 20. A notice posted by Westgor Funeral Homes said that the memorial mass will be held at noon on Saturday, April 6, 2019 at St. Gabriel Parish, 900 Geiger Street, Neenah. Visitation will be held at the church from 9 a.m. until the hour of the service. A complete obituary will appear as soon as it’s available. Richter was reported missing on February 10, 2019 when he failed to return home after spending the day in the Jacksonport area, according to the Door County Sheriff’s Office. His last known location was Cave Point County Park. Search efforts have been on-going for the past six weeks. It wasn’t until March 20 that officials were called that someone had reported seeing a body. A Department of Natural Resources warden was able to launch a boat at Baileys Harbor and responded by water. The warden was accompanied by firefighters from the Sturgeon Bay Fire Department. The remaining personnel responded on land. Recovery efforts were hampered by rough seas, high winds and slippery rocks. After working in arduous conditions for several hours, the body of a white male was safely recovered from the water at 4:30 p.m., according to the sheriff’s office. Dan Plutchak, a Wisconsin native, is founder of the Plutchaknews Network.